For all the people who don’t trust Yahoo to take on Tumblr without screwing it up, may I suggest you take a look at what happened to Flickr yesterday? I find that a huge improvement in appearance, however there may be ads now, although the announcement of the changes doesn’t mention this. Going forward, there will be 3 account types. The FAQ page also explains how to make sure your Pro membership is renewed. You can go to your account information to see if you are set up with a renewing subscription already. If not, you may want to sign up for automatic renewals. Here are Flickr’s instructions, which are less helpful than going straight to your account settings. Anyone who was Pro at 12:00 am (midnight) GMT on May 20, 2013, may be eligible to sign up for recurring Pro in order to extend their Pro membership beyond its expiration date. those whose one-time or gift Pro memberships expired after 12:00 am GMT. those who are on a gifted Pro account. those who have purchased one-off Pro and are set to expire in the future. To keep your Pro status by signing up for a recurring Pro subscription, visit the account order page. Is it Yahoo VS. Google now? Yahoo is making big moves with the purchase of Tumblr and the changes at Flickr. Does this mean Yahoo is back in the running as competition for Google? Since Google seems to be taking over the world, I think a little competition may be a good thing. Flickr recently announced that Picnik (set to disappear completely from Flickr by April 19) will be replaced with the HTML5 based image editing tool Aviary. In case you missed the subtle nuance of the phrase HTML5 based, I remind you that means it will work in iOS. Aviary is a plug-in that works in mobile devices and in the desktop browser. Aviary also works with Facebook. Flickr promises it will be faster than Picnik. Some Flickr accounts can see Aviary in place right now. Using it is similar to the way Flickr worked with Picnik. Here’s a look at how to use Aviary from inside Flickr. 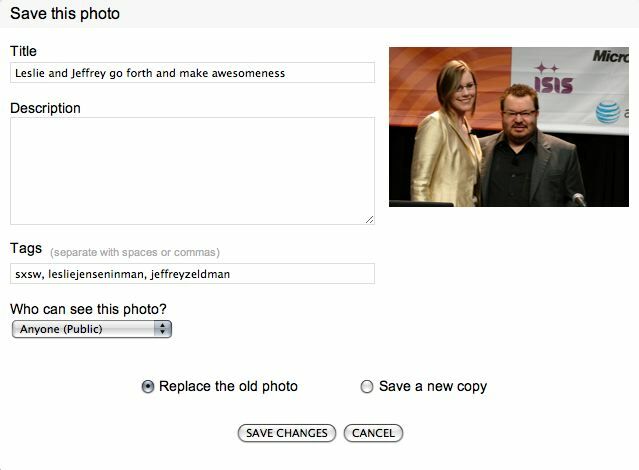 Here’s a photo I took of Leslie Jensen-Inman and Jeffrey Zeldman on the stage at SXSW in March. It’s on Flickr and ready to edit with Aviary. You’ll only have to do this the first time you use Aviary. The image opens in Aviary’s editing window. You see a row of tools across the top of the window. The options include such things as enhance, crop, and brightness. Note the arrows. Click the arrow and you find additional editing tools. With these tools you can do things like hide redeye or blemishes and sharpen. When you save, you can choose to change the photo’s title, add new descriptions or tags, determine who can see the photo. Most importantly, you decide whether or replace the existing photo with the edited one or to save a new copy of the image. After you click Save, you are right back in Flickr, ready to move on. Are You Happy with the New Photo Editing Tool? I’ve used Aviary for a long time and watched it grow. I’m happy to see it integrated with Flickr. It’s a good replacement for Picnik – easy to use and robust enough to do the job. I’m pretty happy about this development. Are you happy with it? Note: This article is cross-posted at BlogHer in a slightly different form. I read so many HTM5 posts, I decided to use scoop.it to curate a site called HTML5 News. You can subscribe to HTML5 News by RSS. If you don’t want to subscribe, I’ve put a link to it in the sidebar here on Web Teacher. You can find it there if you want to take an occasional look. I’m open to new sources of news if I’ve missed any good ones. You can suggest sources on the HTML5 News site. We need to face the fact that I’m now officially a fan of apps that allow me to organize and curate topics in which I have an interest. I use Flickr to collect photos of women in tech, I use paper.li to collect tweets from women in web education, and now scoop.it. Are any one of these tools better than the other? No, they all have a purpose. Then I did a little test to see what social networking tool would bring more views into my Flickr account. I sent one photo to Twitter, posted a different one on Facebook, and a still different one on Google+. Only the one posted on Twitter brought in many views to Flickr. But, of course, the ones on Facebook and Google+ were full size on those sites and there was no need to click through to Flickr to see it. Something I’ve noticed before when sending photos to Twitter, there’s no exploring in my photostream. People look at the one photo and leave. There are thumbnail photos in a column on the right of similar stuff. Even on an iPhone, you can see additional photos besides the one you’ve clicked to see. If people are interested enough in Eliza Gilkyson to click through from Twitter, why aren’t they curious about other photos in the same photostream that are obviously related? If they look at photo on Facebook or Google+ that says, “took a bunch of photos at a concert – here’s one,” is there no incentive to see more? This little test doesn’t prove much. I sound a little like I’m complaining, but I’m not. I’m just wondering. I’m not spending any time trying to get traffic to my Flickr photos; that is not one of my goals at all. But . . . what if I were trying to get some recognition as a photographer? Is sharing on social media the best way to do that? What is the strategy used by photographers who want a following? Have you played with the map function on Flickr? I’ve been ignoring it, choosing not to give my location on my photos because I put up a lot of family photos and I didn’t want them identified by location. I administer a group on Flickr for Women in Tech. Maybe you’ve noticed the tiny slideshow of the images from that group pool in the blog sidebar. I clicked on the Map view in Flickr while looking at the Women in Tech photos in the Flickr group and was delighted to see the results. Thanks to the folks who do have mapping enabled on their photos you see this map. You see a thumbnail of the particular photo and a marker on the world map showing where the photo was taken. If you use the left or right arrows in the thumbnail window to move to different photos, the location markers on the map change. If you click on a location marker, images associated with that location pop up. If you click on a thumbnail, the location marker is highlighted. You can sort by interesting or recent. Can anybody see where my geotagged photos were taken? Is the location private? That means I’m going to start geotagging photos from conferences and public events. Yes, indeed. I can now say that I have eaten Gino’s Chicago style deep dish pizza. My education into American regional cuisine is complete. Thank you BlogHer09 for taking me back to Chicago and to Suzanne Reisman from CUSS and other Rants for inviting me to dinner with her family. Over at eHow, there was a glitch in the machinery, and it was not possible to post some of the things I had written and ready to go. My list of articles at eHow is rather sparse this month, but more will come when eHow gets things working again.